Not every sickness gets its own season. Flu season comes between the months of October and May, threatening us with a potentially dangerous but very avoidable virus. Scientists don't know why influenza thrives during its “season,” but they suspect that our own behavior plays into it. During the colder months, we stay indoors, and we're more likely to be exposed to sickness through coughs, sneezes, and other types of germ transmissions. This year's flu season is just getting started, according to Dr. Michael Jhung of the Centers for Disease Control's Influenza Division. This is an unusual year – only once during the past 29 years has the flu season been so late-starting and mild. But a mild and short flu season doesn't mean the risk of flu should be ignored. There are steps that you can take to make this year flu-free. The first piece of advice on flu any healthcare professional will give you is to get vaccinated. Although flu season is already underway, it's not too late to get a flu shot. Influenza is an unpredictable and rapidly changing virus, with many different strains that circulate around the globe. Each year, scientists create a new vaccine with the three strains predicted to be most common. That's why you have to get a new flu shot each year. The strains you were protected against last year might not be the same as this year's strains. This year, the vaccine protects against protect against an influenza A H3N2 virus, an influenza B virus and the H1N1 virus, also known as swine flu. There are now several options for getting vaccinated. Regular flu shot – This is the common flu shot you'll find at doctor's offices, clinics, and pharmacies. It's approved for everyone over six months of age. It is injected into your muscle, usually in your upper arm. Intradermal flu shot – This shot doesn't hurt as much as the regular flu shot, because it's injected into the skin instead of the muscle. The needle is 90 percent smaller than the regular needle, and may be a good option for people who hate getting shots. However, you can't get this shot until you are 18 years old. High dose vaccine – This vaccine is designed for people 65 and older. It produces a stronger immune response in seniors who have weaker immune systems, and provides greater flu protection for them. It is four times the dose of the regular shot. Nasal spray vaccine – For those who can't stand the thought of a shot, and are between the ages of two and 49, it's possible to be vaccinated with a nasal mist called FluMist. It's made with live but weakened strains of the virus, as opposed to the regular flu shot, which contains the dead virus. The nasal spray is not recommended for people who have medical conditions that put them at high risk for complications of the flu, and it is not given to pregnant women. Getting a flu shot will provide you with a high level of protection against the influenza virus, and that's especially important for people who are at a high risk for developing complications that might land them in the hospital or result in other serious illnesses. Other people who should make sure to get vaccinated each year include health care workers, family members of children under 6 months who cannot be vaccinated, and people who live in homes with those at risk for complications of flu. Influenza is spread from person to person by germs that flow out when a sick person sneezes, coughs, or talks. Flu germs can be transmitted from up to six feet away! Flu can also be spread if a person touches a surface with a flu virus on it, and then touches their mouth or nose. Flu is contagious for a relatively long period of time. A person is contagious one day before symptoms appear, and then up to seven days after they've become sick. If you're trying to avoid the flu, it's important to keep your distance from people who are sick. Dr. Jhung of the CDC recommends practicing good hand hygiene. “Wash your hands often and well before you touch your face,” he told dailyRx. Soap and water suffice for protection against the flu, or an alcohol-based hand rub if you're not near a sink with soap. Good general health habits will also help protect against the flu. Getting plenty of rest, exercising, eating well, and managing your stress makes you a healthier person. You'll be trying to keep your distance from people who are sick, but also be aware of best health practices for those around you when you're the one who is sick. Simple things like covering your cough and staying home from school or work can slow the spread of flu among your friends, family, and colleagues. But there's a proper way to cover your cough. Coughing or sneezing into your hands can still spread germs, especially if you touch common surfaces or objects afterwards. Cough or sneeze into a tissue, then throw the tissue away. 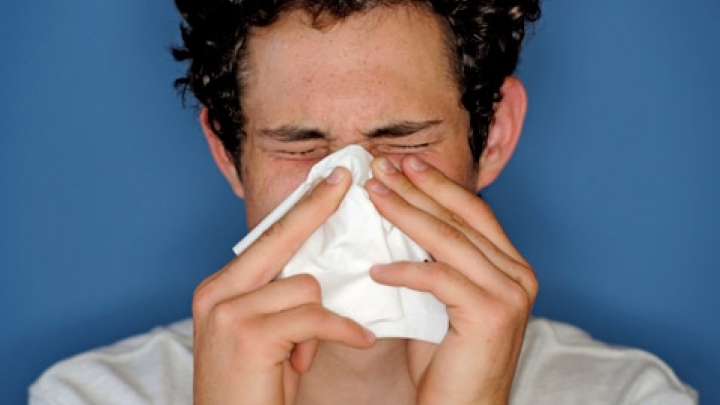 If a tissue is nowhere to be found while your nose tickles, sneeze into your upper sleeve. If you're extremely cautious, a facemask can provide protection against spreading your sickness. If you suspect you have the flu, see your doctor. He or she can give you a diagnosis, and may prescribe anti-viral medications. These can come in pill, liquid, or inhalant formulations. This is especially important for people who are at high risk of complications. Flu, left untreated, can progress into pneumonia, bronchitis, or sinus and ear infections. Flu can also make chronic health problems like asthma or heart disease worse. While many people may not consider flu a serious illness, it can result in hospitalization or even become life-threatening for some patients. So far this year, two people have died from flu-related illness. Is This Flu, or Just a Cold?